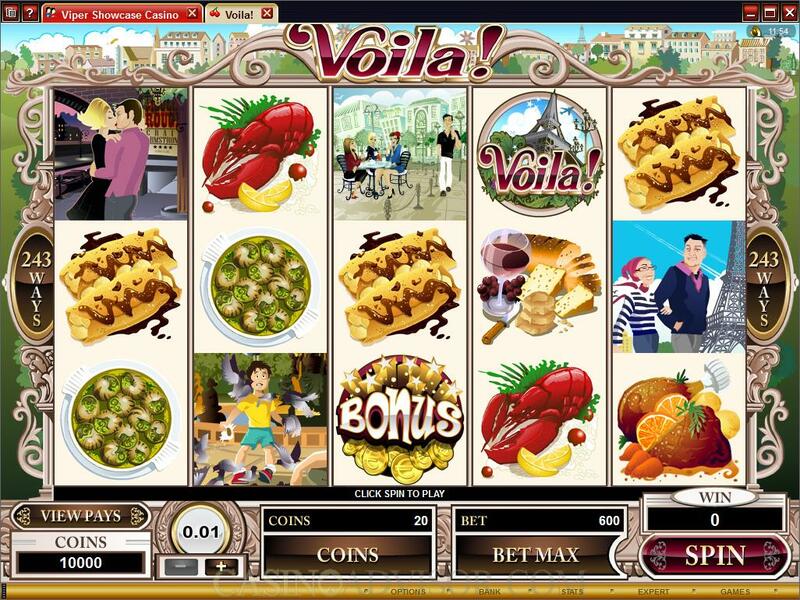 Voila is a French word and the theme of the slot game is Paris. Two aspects of the beautiful city are depicted on the reels. One is the culinary side of Paris with its gastronomic delights. And the other is the romantic side set in the typical Parisian landmarks. The food items include Meat, Lobster, Snails, Wine with cheese and bread and Desert. There are practically no audio effects. However the animations in the romantic set of symbols are interesting and detailed. In the Café symbol the girls are drinking coffee and holding a conversation presumably about the man who just strolled past. In the Pigeons symbol the pigeons flutter about the boy and a fountain spouting water can be seen in the background. During big wins there is a shower of gold coins that have the Euro symbol embossed. 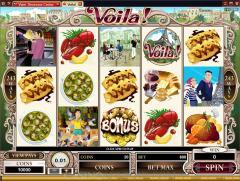 Voila is an All Pays slot game. All possible 243 paylines are automatically activated. In order to pay out like symbols have to appear from left to right but can occupy any position on the reel. Players can wager up to 20 coins. The coin size varies from 0.01 to 0.20. The total bet per spin is automatically fixed at 30 times the line bet, even though 243 paylines are enabled. Hence the maximum total bet per spin in coins is 600 and in credits is 120.00. The Voila Logo is the wild symbol and it offers the highest fixed jackpot. It also acts as a multiplier when it substitutes for other symbols in winning combinations. The multiplier amount is not fixed but can randomly take a value of 2x, 3x or 4x. The Bonus Logo is the scatter symbol. When two or more appear anywhere on the reels the player receives scatter payouts. Three or more scatter symbols trigger the free spins bonus round. 20 free spins are awarded to the player at doubled payouts. If three or more scatter symbols appear on the reels during the free spins further 20 free spins are awarded. The top prize during free spins is 60,000 coins. 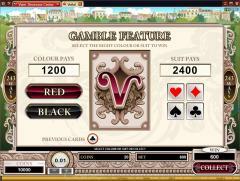 Voila also offers a gamble game. When the player receives a payout he can either collect it or stake it in the gamble game. 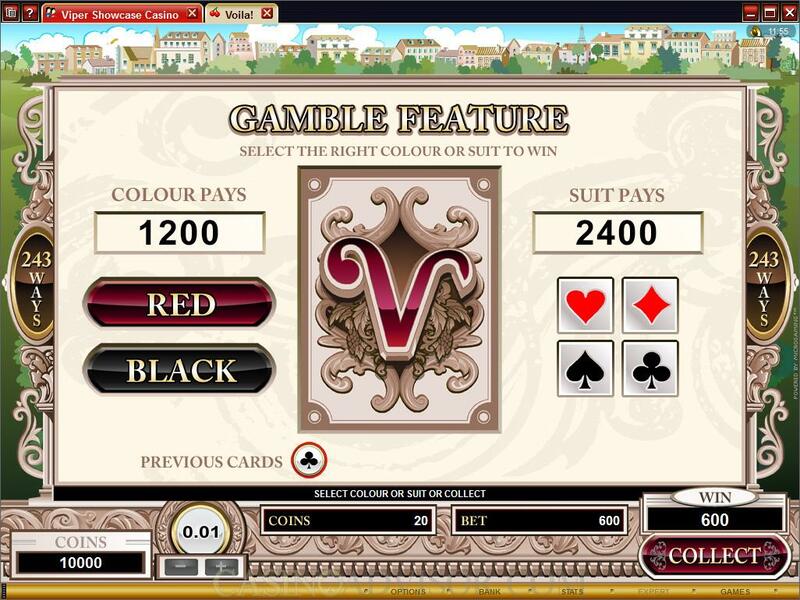 In the gamble game the player can choose to double his payout by predicting the color of the next card or quadruple his payout by predicting the suit of the next card. If the player fails to predict correctly then he will lose the payout won during the spin. Voila can be played in the Expert Mode. Setting the betting options is more convenient in this mode. However, the biggest advantage of this mode is the Auto Play feature. Players can activate 5 or 10 auto spins directly. If they want more auto spins then they have to use the set up menu. Interested in reading more detailed information about Voila? If so Click Here for more details.